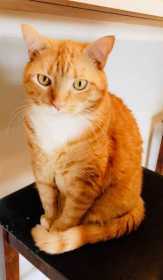 Orange Tabey, white chest & paws, 6 years old. She's not used to strangers so she may be timid and stressed. Her home is in the Victoria Pines Complex near Curry Ford and Dean, Orlando, FL.